It’s easy to focus on the difficult aspects of being tightly wound women, but let’s turn the phrase and turn our hearts to the One who draws us close—under His wings. I am the Tightly Wound Woman. Wound up in a Love that has no bounds. Created by the One who is truly in control and always perfect. Delighted in by the Strong, Capable Savior who pursues my heart. Dependent on the One who upholds me and calls me to rest. At peace when I live with open hands and trust His lead. Accepted and approved through Christ who died to redeem me. Given grace by a loving Master who has my best interest in mind. Delivered, desired and declared pure by the One who has finished the work once and for all. 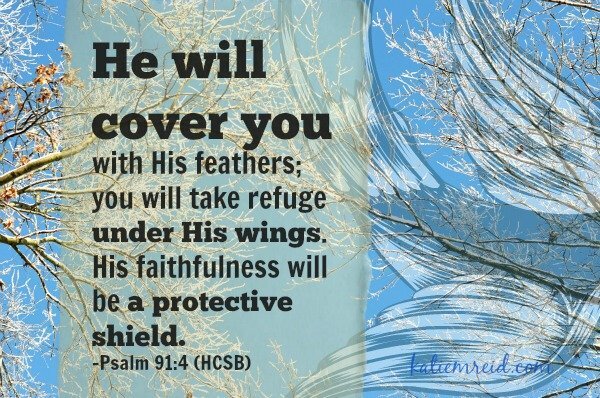 I can live confidently, not because of my strength, but because of His Sufficiency and Faithfulness. I see how extravagantly He loves me as I count all the blessings with thanksgiving. I am being renewed day by day as I tap into the source of truth; transformed by the renewing of my mind. I am learning to trust Him even when the unexpected happens. I am walking with Jesus down this bumpy path and finding grace in the unraveling. I am held close by the One who formed me. It is a joy to speak to the heart of tightly wound women. We can often feel misunderstood and lonely in our uptightness. Thank you for reassuring me that I’m not alone in these struggles with control. It’s a gift to grow together in grace as we confess our tightly wound tendencies and move towards freedom. At the beginning of each month you receive a love letter on the blog addressing various issues that wound up women face. If you need some encouragement today, read through the letters and let the Lord draw you close. I’d love to hear from you. 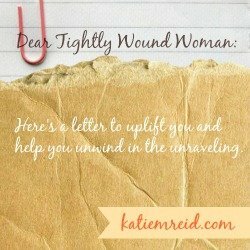 What are some topics that you’d like to hear about via “Letters to the Tightly Wound Woman” or in other posts on this site? You can leave your response in the comments or email via the contact form (top right tab on this site). Today, I’m over at ForEveryMom.com sharing one of the Tightly Wound Woman letters about “Feeling Down”. Join me over there as we lift up our eyes to the One who loves us “as is” and is able to unwind us in His Presence. P.S. Be sure to subscribe to the blog (subscription form is at the top right of this page) so that you don’t miss any encouragement as we learn to let go and live free.